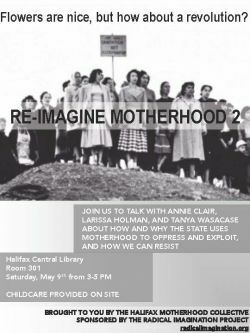 The Halifax Motherhood Collective invites you to join us for our Second Annual Re-image Motherhood Event: State Control of Motherhood. With the help of our invited speakers Annie Clair, Larissa Holman, and Tanya Wasacase, we will explore the ways in which idealized motherhood is constructed, directed and enforced by the state. What results when state policies are guided not by the inherent value of women and children in our society, but rather by a colonialist, racist, capitalist and patriarchal ideology? 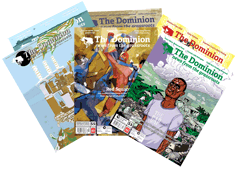 What are the mechanisms engaged by the state to accomplish their goal of controlling our reproductive labour, and how can we resist them? This is a child-friendly event - children are welcomed to join us. A limited number of childminders will be available to supervise children on-site.